How do I Repair a Japanese Lantern? Japanese paper lanterns provide a soft, pleasant glow to any room and have been a popular home decor item for 2,000 years. Traditionally, these lamps are made from rice or silk paper over a bamboo or wire frame. The delicate construction makes these lanterns susceptible to small rips and tears or large holes. These lanterns are easily repaired with simple materials as long as the frame remains intact. 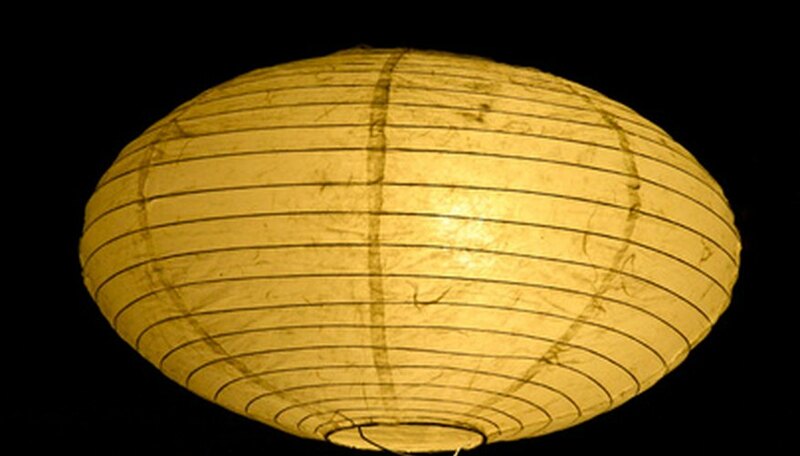 Remove the paper lantern from the light fixture, taking care not to further damage the delicate paper. Examine the damage and determine if you will need to simply close a small tear or cover a large hole. Cut a piece of rice/silk paper large enough to completely cover the tear or hole with a half inch border on all sides. Carefully place strips of double-sided tape around the border of your patch on the side of the paper that will be visible. Position your patch over the tear/hole from the inside of the lantern, while checking from the outside that the damage is covered. When the patch is in the proper place, very carefully attach it using the double-sided tape. If necessary, use additional double-sided tape to fix any loose pieces of paper from the damage to create a smooth, seamless look. For minor damage to the frame of your lamp, a small length of wire hanger can be bent into shape and super-glued in place to maintain the shape of the lantern. Never use a candle with a paper lantern, unless the packaging expressly states that it is created for that purpose. San Francisco-based Kirk Johnson has been a freelance writer since 2005. His articles and essays on the entertainment industry, performing arts, college life, and other topics have been published in "Tempo" magazine. He holds a Bachelor of the Arts in drama from Coastal Carolina University.